Well Acea you first need to have a desire to do well in your classes, not just whimsical wanting but a real desire is to pay the price to achieve what you want to achieve. In terms of studying for math it is easy to study because you just have to master and be comfortable knowing how to do the math. If they still have that math center, go to that and if you have any questions ask them to explain. For English I am not that great, but there is a writing center where the computers are and you can go there to get help making your paper good and getting started. There is always a least a little bit of extra credit; when it comes up take advantage of it. The remedy is to study your heart out, always be taking notes and reading the material needed. And what helped me a lot was to study for 30 mins in the scriptures before I studied and it was a lot more pleasant. If you are not already taking institute class, they also help a lot by having the spirit with you during the day to not get stressed out and learn well. These are just some things that helped me so remember I am not the smartest guy on the block but because of the force of will and hard work I was able to get pretty good grades and you can too, you smart devil you. Finishing my mission is a bitter sweet thing. I want to share and baptize more people and the experience is so great, but when you are working so hard for your whole mission, you get tired and you know that it is time to finish your time allotted to us and use it well. Don't worry here in Valinhos where I will probably end my mission has is a lot more work to be done. My goal for these last 3 months is to help 10 children of our Heavenly Father enter into the waters of baptism. I have never done this in such little time but with the help of Heavenly Father and our unrelentless work we will achieve this desire. This last week for church we were able to get one of our investigators to church who is really devote in his other religion but we will work with him this week to try to help him know these things are true so that he can be baptized soon. We also have a few other people that we are trying to get baptized but they need to go to church first. Well I don't have too much time but I just what to tell you all that I love you so very much! Well I don't exactly know the time next week to Skype maybe it will be 5-6 my time in the evening but we need to ask the member to see what time we can do it at his house. Well this week has been raining quite a bit, we just hit the Brazilian raining season, but it helps keep us cool from the intense heat. We worked our tails off this week contacting all of the people that already went to church in the area book to see if they can get baptized last week, but it turned out that they all need to get marred so we will work with a few promising families. Yesterday the only investigator that went to church was Eilton who is ready to get baptized; all he needs to do is plan to get married here soon with his girlfriend he is living with, and they live in another city and want to get baptized here, but he is planning on moving her to Valinhos. Our stake president already okay-ed that we can teach him we just need to get the OK from President Perrotti. We had a wonderful Christmas dinner at the Church building on Friday and a lot of people brought friends and we were able to contact them to pass by and teach. On Saturday too we had a Christmas presentation at the temple of choirs and a lot of people bought friends and family and we were able to teach a lot of people and references for other missionaries in the other areas. And we got to sing silent night that was pretty neat and people said that the missionary choir was the most spiritual so I hope people were changed by the spirit. I might send another Short email in a few days to see what time exactly I will be skyping you, and did you already send to package? On Christmas it will probably be at night my time so maybe around lunch your time or yearly afternoon and that should be really great. This week was really good we were running around trying to contact a lot of references we have been given. We were able to talk to a lot of them but they didn't really pan out but I felt great knowing we did our part. But this week we are going to go with our ward mission leader and hit up a neighborhood that we all think will bring a lot of fruits and get many results. We are getting to be great friends with the members and we have had so many people invite us to Christmas it created conflicts. This ward is very capable with many well off members they work wonderfully together to plan activities and are very missionary minded and they are able to use their great influence to bring many people to actives so that we can then teach all of them. That is great Acea that you are doing well in college it was my favorite part of high school and I learned a lot of how to study and spend a lot of time learning. To answer your question I am in the city of Valinhos which is 10 min away from Campinas and 15 minutes away from the temple and it sounds like the family we helped baptized last year will be going to the temple the 22 of December so I will be going to the temple for that. Something really cool happened on Saturday. We weren't with anyone to baptize this week and really no progressing investigators and all of the sudden we got a call of Flavio Cooper who is the first councilor to president Perroiti and said that his mom, Maria Thereza, after 38 years wants to be baptized so we hurried and called the district leader over and he gave her the interview and the next day she was baptized with her great grandson it was truly a miracle that helped us be even more excited to work here. We are finding so more people, but in the meantime we are helping a young man in the ward get over his struggle with drugs and we are helping as much as we can this family. Really we are trying to serve this ward with anything we can find and they are starting to recognize that we are here to help and be a blessing rather than being a problem. Let me know what time would be good for you guys for Skype on Christmas so we can plan it soon. I am doing great here, but it always seems that there isn't a lack of trail and hardships when you think you are doing everything right working hard that is when it is the hardest, but this is good it helps me grow a lot faster and when it is easier we know how to handle the hardship. We have been trying to Preach the Gospel, One thing that I just can't resist is telling people about the gospel I don't worry anymore if people accept or reject I will do my part at all costs that is where we find the most joy. The mission has just been one blurry but good memories where you forget all of the bad days and difficulties and just remember the people that you have baptized, the wonderful members and companions, and the fun with other missionaries. This next week I will have 1 year and 6 months in the field and with this time remaining we will do a lot more good. I forgot to take a picture with Sister Ward, but the next time I see her I will talk a picture of us for the newsletter. Did you see the picture I took of the Campinas temple like you wanted? Is it good? How are you all doing today? That is great that Acea gave that talk it looks like was really good parabems. The Work is going here in Piracicaba 6, we are trying are very best to do our part even though investigators don't really want to do their part. Tomorrow we are having a special multi-zone conference with Elder Mazzagardi who is the second counselor of the Brazil area presidency which is going to be really good, and it will help a lot to be better missionaries and more effective to. It is getting really hot here it is almost 40 degrees C 104 degrees F and dry as can be with the last rain fall 3 months ago. We are also planning on baptizing the wife of a member that return and he is ready to baptize her we just need to mark her baptism and teach her the rest of the lessons and fill up the baptismal font and she is well on her way to get sealed and return to the presence of Heavenly Father. There is not much more to report just keep me updated about the election and the family and I will talk to you all next week. Also I will send another DVD of all of my videos that I have taken on the mission so that you can see them; it is the easiest and fastest way to get them to you. Thanks for the email they are always good, and it is good to feel some support from home, and I received a letter from sister Schmauder last week that was great. To answer the Question how I am doing on my mission I was just thinking what I could say. I am doing wonderful. My mission is the greatest where we can do some real good. My story on my mission hasn't been the one where we have baptized 300 people or been a grand leader, but I know the Lord has been pleased with my work and I have seen how he has changed me to be like him. I have been in gosh darn hard areas and I have seen the miracles that we have received after all of our hard work. Many times I have thought who can we baptize, how can we do it and it is crazy to see how the Lord has given us more than we were hoping. With this family that we have baptized these weeks It has been months were we haven't seen much progress in the work and baptisms, but we worked, we worked we did our part we cried a bit in our sweat, but the Lord was preparing us, teaching us, and taking care of us and we were rewarded with witnessing the gospel changing the lives of a family and to see the whole ward light up with hope and energy to work with us to save our fellow brothers and sisters. My mission is ending fast, but the work is far from over. I will get your letters next week because P-Day moved today to Monday like I said a few times. I am so excited in everything. We are planning the baptism of Cintia who is the wife of the man we baptized on the 25th this Saturday and we are all excited, Erico was confirmed yesterday and they are all wearing Sunday best and are so happy, and here in one year they will get sealed. After all of the difficulties that I have faced the lord is rewarding us for our patience and long suffering. We are also helping another wife of a member get baptized we are just waiting for him to be able to baptize her because she only wants him to do it which is perfectly fine and great. We are working hard to reach all of our goals and pass the mission standard of excellence. When we try our best to reach and pass that standard I feel we are blessed with people to teach, are lessons don't fall through, and we are happy knowing that we are doing our part. My companion Elder Jamilson is a blast one of my favorite companions yet, he is funny had helps with that everyday stress that we all feel and he helps a lot because he knows how to work and we are a good team together. I will get your emails next week but I am fine with that. I will talk you all later. Thank you for the address to Elder Bailey's mission I got a letter from him yesterday. Can you tell Ryne's mom that I got it please and that I will write him soon. Don't send for more shoes please, these shoe that I got would won't even be that worn out when I get home and I don't want to pay another 100$ to get my package. Don't worry dad I haven't been serving a mission with regrets, it is just to get everything done that I want to do and become what I want to become in these final month and not wanting this wonderful mission to end, it has passed so darn fast because I have been giving my all in this work. Yesterday we had transfers I stayed in Piracicaba 6 but Elder Melo left and went to Campinas, I am here with Elder Jamilson another Brazilian, he is a great guy and really funny, and we are going to do a lot of good together in this transfer. On Saturday we had the baptism of Erico and his two sons it was really special and all of the members are excited because this was the first baptisms in the ward in 6 months. We talked to his wife this last Monday and we marked her date for next week so that she has time to ask for that day off and so that Erico can baptize her next week after he receives the priesthood which will help this family become really united. And here in 1 year they will be going to the temple to get sealed. Please too can you send me those family pictures that you took that would be nice to see and share with the member here. This week I am so excited after almost 3 months without baptizing anyone we are going to baptize a family of 4 on Saturday I am so excited. After all of this difficulty and learning we are receiving a lot of blessings. This family is very special their names are Erico, Cintia, Murilio, and Victor they are relatives of a family of members here in the ward and they all want to be baptized a lot. We are having a little difficulty teaching them because their work schedule is really strange but everything will work out in the end. There have been a lot of twists and turns here in the Field and from them all I have learned many things. I have had my bad days and good days, but I can see how the Lord has helped us. This is the final week of the transfer and I am almost sure my companion Elder Melo will be transferred and I will stay here. Time is flying by so fast and my goal for these last 5 transfers is just go crazy with the work, work harder than I have been working and to enjoy these last few months that I have here. I don't remember If I had already took you all but starting the 3 of September which is a Monday we will be having P-day, that will be a somewhat big change but it will be better I think. I told myself I would never ask but I only have 7 months left, is that for those you know that have not written a letter to me yet I would be so grateful to receive some letters. I have only received 5-6 letters on my whole mission so encourage everyone to write please. The work is getting better we were able to teach more people this week and help them prepare for baptism, but sometimes it feels that we are cutting more people than we are finding. Yesterday I was able to go to a leadership meeting in Campinas and President Perrotti has given a new stress on reach the standard of excellence in our mission. Really by reaching this standard these goals we are able to do our part to show are sacrifice to the Lord and a way to build and maintain our teaching pool and help them be baptized. Every week here we are getting better, by finding more people, teaching them, teaching a lot more with members it is really neat. We are really focusing on getting a family of four baptized, they already have been to church several times, and what it sounds like they are wanting to be baptized but the hard thing is going and teaching them, we mark and something happens we remark a visit but something happens and they could be there, but today I have faith we will finally be able to teach them and mark there baptism. One more thing p-day will change to Monday starting September 3 so don't forget I will be really sad if I didn't get emails that week. The updates sounded wonderful it is great to see that everyone is doing well. But we will work even more harder so that everyone back home will receive lots of blessings. This last week, I won't lie was tough. My companion was feeling down not baptizing his first transfer and half, we were not knowing what we could do in the small area to find more people and teach them. But on Sunday we had a miracle. We planned a last effort and punch to get the members to work with us or the area will close. What they decided to do is to do a door to door study asking them questions if they know that the true church of Christ was on the earth with a prophet and apostles will you join and other questions to gauge the interest level. They when out Sunday night in 4 groups and in 1 hour gave us 31 references only 4 streets, we are working a lot to contact and teach every one of them and we know that we will help many people to be baptized here very soon. We had interviews with President Perrotti and he helped a lot with support and words of advice that helped a lot. Elder Melo and I are going to do some great things here. That sounds like a lot of fun, I know now what I will do when I get back home and maybe in Logan with you guys. But here in Brazil we are having a lot more fun. Today we had a Zone Churrasco (BBQ) with a lot of meat, we played some soccer (Futebol) and some game that is like doge ball but with only one ball, it was a blast. The work here is progressing and we are doing our very best in an area that isn't the easiest area. we are needing the help of the members to find people so that we can teach, we got a reference of a family that is ready to get baptized, but the problem is that they live in the boarders of another ward but it really far away from the church building and our ward is closer and they have really good friends here and they only want to be baptized here. Everyone in the stake and been pleading to change the ward boundary's that are out of date so we have to see what happens. We are also teaching a man named Bibi who is a friend of an inactive member, he is really good and wants to get baptized and we marked his baptism for the 12 of August he just needs to wake up early to go to church and he will be good to go. The inactive member named James is helping a lot by sharing his testimony with him and giving support. This ward is great the members are good people, and it is the first ward I have seen here in Brazil were there are a lot of returned missionaries, which helps a lot and they know what we are going through and helps us with ways we can work here and have a focus of inviting people to go to church. Thanks for the love and support always love, hugs, and kisses from Brazil. This week was very good; it was a little bit of a rough start because we had a Zone Conference on Thursday and had only 3 days to work. I forgot to tell you that I saw Sister Ward at transfers and at the multi-zone conference, it was go to see a familiar face and some up to date news of what is going on back home. The Zone conference was really good; it was the really first time getting to know President Perrotti. The zone conference was the answer to our prayers. This area I think is the hardest area I have served in were the area is really small and all of the missionaries in the past have already worked in all of neighborhoods, so we need to work a different way starting with creating a really good relationship of trust with the members so that they will want to give us references. We are also working with the part member families and we are finding a lot of people that haven't yet been baptized and where we can reactive and baptize. This last Sunday we had the conference of the ward and everyone worked hard to invite everyone, our goal was to have 150 people in the sacrament meeting and we arrived at 153. Right now everyone is way more excited to work and with baptisms here in the following weeks we will get this ward up and running again. Well dad it sounds like you busy with work. That is a little said that the Wilhelm's moved. One thing I noticed here on the mission is that there has been a lot of changes, but you can feel the blessings more abundantly. To answer your question I got to meet President Perroiti on Sunday, it was really a surprise. It was our Branch Conference and we got a lot of training by the district presidency and the mission president. We also had some miracles happen. We went out to pick up our investigators to go to church, but none of them went. But other people that we invited went to Church by themselves and other people we weren't expecting went as well. We had a total of 75 or more people in the sacrament meeting and I can feel that everyone was more excited, and a few families that we were reactivating came to church as well. Unexpectedly President and Sister Perroiti came to our apartment not to find it the cleanest as it could be, but we said that we would clean it and send them the pictures to them. Well. I'll talk to you all later. Acea that sounds wonderful and I am glad you had a great time at PALS camp. It really helps you grow. And to answer your question about the language it is pretty much fluent. You will always have some sort of accent because as I wasn't born in Brazil. But to speak without really thinking about it happens pretty quick in the field. It is just of matter of perfecting the language. Sometimes it is way harder understanding then speaking but is also depends on the missionary. This week was good we had some great things happen in the church, none of our investigators went which is always sad, but a few people really inactive went. In the Branch we don't have much to work with and we are really focusing here in reactivating people to be leaders in the church and help the work progress. This transfer ,what I have been seeing, is that we are having a different kind of success with helping the Branch stabilize at its foundation helping people return and working a lot more with the members. We are teaching Jefferson who is progressing, is works weird hours and he started being able to go to church this last week. We just have to help him really decide to be baptize form what he already knows and feels is true. We started working in another area because where we were wasn't really going anywhere. We are able to use our Branch mission leader in this other area and really get the work progressing. Transfers are this next week and I don't know what will happen. I am wanting to stay, but no one really knows what happens, sometime the day after transfers. It sounds like it will be great having Levi and Julie there at home, but just remember don't have too much fun hahahah. I will send some more pictures I am almost caught up so in a few weeks I will send all of my pictures. That is crazy that Karyl's friend was kidnapped I want to talk to him to see where he served here in Campinas. There have been a few things happening. This transfer has been really trying our faith, and it happens so that we can grow. we haven't had many people progress with many people telling us they don't have any more interest, but I am happy because I know that we are doing our part we our giving our best, we aren't perfect but we are really working and I know that we will see the miracles starting to happen for our diligence. We are helping a friend of a great member whose name is Aline who has already been to the church a few times and we are finalizing her so that she can be baptized this Sunday, also we are helping many people come back to the church. We are visiting all of the names on the branch list to see if they still lived there or moved. We have found that many people have moved but there are still a lot of people we need to visit to build up the Branch. This past week we got a new mission president, President Perroti who is a Brazilian from Sao Paulo. He seems really good but we will really see the next zone conference here in a few weeks. That is that is happening so far. I got my shoes well there here in Campinas but there is a little problem, I have to go in and pay a tax of 80 dollars to get the package, what did you guys declare on the package? I heard that if you declared that what is in side is more than a certain price they put on a tax but I will find out everything this next week when I get my package and let you all know how to avoid the extra tax. These last week went very well, Gustavo a young man that we were teaching was baptized and we just need to baptize his dad to completely have everyone in the family baptized it will happen very soon I hope. This is the last week of Elder Pietz here in the mission, and we are trying our very hardest to do our very best to go out with a bang to help as many people as we can. We are helping a young woman stop smoking this week so that she can be baptized this Sunday, she feels she needs to get baptize but we just need to help her overcome this obstacle. The mission is very great a great blessing to serve the lord and learn and Grow. I can't believe that Brother Osborn passed away? It sometimes is so hard to see people that you know end their mortal existence and going to the spirit world but I have a Peace and comfort that they are doing a wonderful work and that they fulfill their purpose here on the earth. Sorry I didn't right to you guy yesterday Elder Pietz and I went to the temple for all of the missionaries going home this transfer, it was wonderful, it was the first time in the Campinas temple but I loved the sweet spirit there at the temple. After that we went to do a little shopping. We went to a tie shop where they sell really good cheap ties like the ones Karyl got for us. There wasn't enough time yesterday to write. Thank you for that good lesson on obedience which is really true and I will do better to be exactly obedient in all that I do. This week we are planning two baptisms for a young man whose entire family are member except for his dad, and a woman who we have been helping quite smoking. This is a great work and there isn't another place I rather be to really help everyone receive the restored gospel being baptized with the authority of God. Thanks a lot for making the order for the shoes, I figured I will take a little bit of time to get them but that will be worth the wait. My other shoes are getting worn but they are fine and I think they will last until the end of my mission. For Mother's day I will be using Skype because it is a lot easier and cheaper and to tell you the truth I don't know how to call, and Skype is a lot better. I think that I will have to do it the day before that Sunday to use the Lan house but I will tell you the time and day the week of Mother's day. To tell you all a little bit more about my new area of Avaré, this is a city a little bit bigger than Perdoes and is a Branch too. The members are really good. They are willing to work, they are excited and they share their love with the people visiting, the only problem that I know about is the fact that a lot of people have become inactive because of past problems which is hard for people to forgive. Elder Peitz and I are teaching some of the best people I have seen of my mission so far. We are teaching a man, named Roberto, that is like that kind of investigator we find in the Ensign who has a strong testimony and is willing to sacrifice anything to live the Gospel. Another, named Carlos, is a English teacher that knows the Book of Mormon is true and likes the Book of Mormon so much that he painted one verse in 3 Nephi on is wall. We are also helping a lady who is overcoming her addiction to smoking so that she can be baptized. For the first time in my mission I am really starting to see the vast blessings arrive, and the diligence and hard work has really paid off. I will talk to you all later. One of my pairs of shoes are pretty much worn out and I will take a picture and send it maybe tomorrow but this week for sure, and the socks I will tell you that it is better to send them there because, first it is almost impossible to find pure black socks and they are really bad, many things in Brazil are very low quality and it would be good if you could send 8-10 black sporting socks, they are thicker but aren't that hot, thinner socks don't last very long in a mission in Brazil. I was transferred and I went to the other side of the mission in the area of Avaré and my companion is Elder Peatz another American, I arrive today and the first thing I am doing is writing to you all it was a five hour trip. This is a good area where there are two people that are ready to be baptized this week or the next and what the missionaries have been doing in the past is to working with a lot of less active members to help the Branch grow and be strengthened. That is wonderful that Ryne going to Reno Nevada how exciting, when will he go to the MTC? And Ben is going in the 9th of May is that correct? That is wonderful to see the wonderful things that are happening back home. I will talk with all of you with Skype again it is much easier and much cheaper but I think I might do it a day or two before mother's day but I don't know for sure. I will send the picture as fast as I can. That is great that everyone is doing great. I didn't know that Julie played the piano or organ that is pretty cool. Well I am in a bit of need, I didn't want to spend my mission asking for things but this time I need some help. Can you send my 1 or two pairs of good insoles, my shoes are going and my feet are hurting and it is very difficult to find and very expensive to buy. also can you send at least 10 pairs of good thick black socks, all of mine have great gaping holes in them and you can't buy socks with quality here in Brazil, the faster the better please, thank you so much. This is the last week of the transfer, I didn't know but this transfer only has 5 weeks rather than the normal 6 weeks. We are also trying to go after two baptisms we are planning for Sunday. I prayed to know how and who we can baptize this week and after I received an answer of two people. One is a son of a active member that returned to the church after being inactive for many years, and another is the brother of Tais the young woman we baptized in march. It is going great and with our faith and effort they both will be baptized. It is also looking like I will leave Perdoes on Tuesday; it has been 6 mouths of learning and changing. I am more confidant in the Lord and his power to help us work miracles and to fulfill the will of the Lord, but only after we do our part. I am thinking of all of the things I will do differently in a new area to find the people that are prepared to accept the Gospel. I will see you all here in a few weeks for Mother's Day. I will talk more about it in a few weeks; what time, what day and everything so that I can talk to all of you. If you can work on the package that would be MOST wonderful and I love all of you! This week was wonderful. We are doing better at growing our teaching pool. This last Thursday we received extensive training on this principle. The reason why missionaries baptize a lot of people is that they are teaching a lot of people, so if one person is not interested there could be one that is willing to accept, at least one person can be baptized every week. We are helping a few families visit the church so that they can be baptized as soon as possible but with a little planning and faith, miracles will happen. We are getting a lot of help from the members here is Perdoes and we are running into a good problem that many members are willing and wanting to teach with us, so we need a better system to plan every one. I think we will start using a calendar to plan every one, and we are receiving much more references. Some didn't pan out and we will be teaching a reference tonight and hopefully we can teach them so that they can be baptized here in a few weeks. Missionary work here is really great. Is Acea teaching with the missionaries, if not I would encourage him at least once a month helping them out, it doesn't really help you practice in teaching or working as a missionary, because he will go to a mission that is completely different in every way, but it will help straighten his desire and testimony. How is Ryne doing, has he received his mission call already, and is Ben on his mission yet. I loved conference! Last time I listened to it in Portuguese but this time I listened to about half of it in English. I always love the talk of Elder Holland and one of the talks of President Uchtdorf about don't judge and if we do, stop it and the bumper sticker that said "don't judge me because I sin differently than you do." This week was great we were running to invite everyone to general conference. It was a little difficult because we watched it in another city close by and the investigators that went had a great experience and I believe that it answered to some of the doubts and needs of the people we are teaching. We found my good people to teach and helping them progress and increasing our teaching pool. These past few transfers I have been learning a lot how to work and teach better and to help people fulfill their commitments and helping them prepare for baptism. I now know how to do many things better, like find people, teaching them in an effective manner and with the spirit, now I need to learn how to help them progress and feel the importance of keeping their commitments. 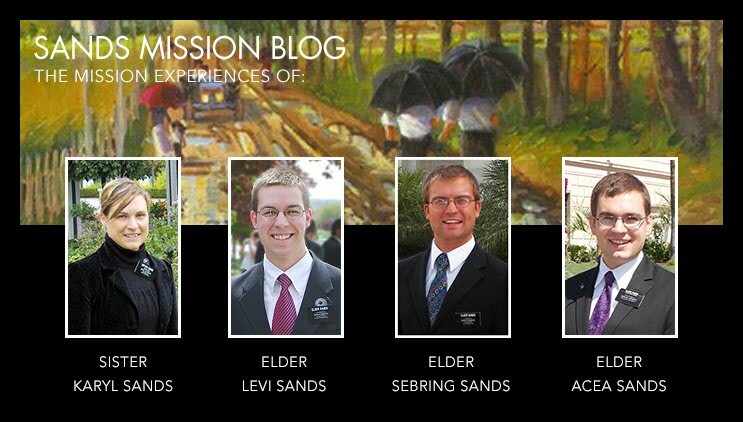 That's too bad that the missionaries are not there anymore. It is far better too have missionaries in a members home. I learned this last week that we almost lived above the ward mission leader who is really great and there family is wonderful, I saw the benefit of this but the missionaries refused to move there because they can't do anything they want without the members knowing a little bit. I liked the missionaries there in our house, the missionaries that were great, not perfect, but we didn't get on their tail hardly at all. This week has been one of the best weeks here in Perdoes. Last week to tell you the truth I was feeling a bit unexcited and discouraged because we didn't have a lot of success the last transfer and our area of strength wasn't progressing and our investigators weren't progressing too. One thing we changed a lot was our work, I learned a lot how to really work this last transfer and at the end we were hitting almost all of the mission goals, we were doing our part. I knew that I needed to work on my faith and this week we are receiving the blessing with many good reference of the members, we found a family really good to teach and baptized and everything is looking up. My goal I want to reach is to be way more exciting in teaching, interaction with everyone and especially with the members to really get this work going here. we are racing to plan rides for all of our investigators for general conference so that they can progress to baptism and help with their conversion and tonight we will have a great family home evening with the family of the ward mission leader to help Caio be baptized this week if we shoe forth our faith and do our part. Thanks for all of the advice and council, it is always welcome! It sounds like everything is doing well at home, Acea is having a wonderful time and that Ryne has put in his papers, maybe he will join us in Brazil in one mission here, but let me know where he is going. We had transfers yesterday, my companion left and went to the other side of the mission and I stayed here in Perdoes with Elder LeGrande an American from San Diego. He is great, a little quite but he has a desire to work and we will do many great things this transfer. We had the baptism of Tais last Saturday it went very well. we did it in a pool of a member , because the pool at the church building is falling apart and we asked for a new one but I think is will delay a bit. What are the top blessings of serving a mission; I thought about it a bit and here are couple of things. 1. The greatest blessing I have received is the blessings my family has received. It started from day one with Levi's marriage I was jumping with joy to see how well the lord is taking care of my family. One thing I heard a General Authority say, when you are on your mission most of the blessings are received by your family, only after the mission is when you receive the personal blessings the Lord has promised for you. 2. The other greatest blessing I have received is helping people change their lives and to see how the gospel changes everything for the better. it is amazing to see how people change, it brings me great joy to see them progressing the gospel and receive these blessing and this is why we are out here to to help our brothers and sister return to our heavenly father through baptism and enduring to the end. How are you all doing? I am glad that Acea had a lot of fun with this date. How is she related to us? And what is her name? The work is coming along, it is truly amazing how much things we learn in such a short amount of time. I have learned many things with Elder Inácio who will leave to another part of the mission because his training is ending. I have seen everything I did well, and everything I didn't do well and with the help of the lord we learned together. This week has been great. We are trying our best to work to find, teach, and help our investigators prepare for baptism this week. We have seen a great increase in the work the members have been doing to invite people to church and helping their friends in their conversions, the work is progressing great. I have learned a lot this transfer with how we can work better and more effectively, and work with the members to share the Gospel. We will have the baptism of a reference a member gave to us whose name is Tais. She has a great desire to change her life for the better and a sister in the Branch has almost adapted her into her family. we will be using a pool in a members backyard because the pool in at the church building isn't very good. I am just having a wonderful time here in the wonderful country of Brazil. The days are hot but it gives us more excitement and energy to work. We are helping two people to be baptized this next week. One is a reference of a member her name is Tais and she will be baptized the 15 of March, she has been prepared for a long time now, it was a matter of inviting her to be baptized and she accepted the date of 15 which is her only day off. The other person is Caio I think I told you about him last week, he is wonderful, he loves the church and is reading and praying and the his baptism will be on the 18 which is that Sunday. We are very excited to have this kind of Success, we know that we have been doing our part and I know that the lord was strengthening our patients, ability to teach better, and strengthening our Faith to help preach the gospel. This week President Tanner has been focusing on the Standard of Excellence for our mission which is 1 baptism per week, 6 baptisms marked, 10 investigator in the sacrament meeting, 20 new investigators, 15 lessons with members, 40 lessons in all. In the beginning we had some troubles with reaching this standard, but with the help of the lord and the leaders we are showing our offering to Christ with our work. Many people think that worrying about this is only worrying about numbers and not the people, but one thing that President Tanner has been teaching is that when we work our hardest and reach this standard the lord will put the people that are ready to hear the gospel n our way, and to reach our potential. Very clever Acea, Maybe a little cruel, but I know you would do something cool because you are very very creative and that is why you do so well creating music and other neat things, who will you go with, what is her name? Well I have some terrible news, the whole mission is terribly sad because of this; we learned in a leadership meeting on Tuesday that President Tanner will end his mission at the end of two years which is this July. We only have 4 months with him before he goes home. If you didn't know, President Tanner has a disease that weakens his legs and other parts of is body, sometimes he can't walk very well because his is in a lot of pain. When Elder Ballard and Anderson came to the mission they noticed he didn't look very well and they spoke with President Monson and he will be released in July. We will get another president, President Perrotti a Brazilian, I think he will be good because his was the church director of seminary here in Brazil and loves working with youth. The work is progressing, this last Sabbath day we had many miracles happen. One is that we received a reference from a member and that she is very interested and we will plan to teach her and plan her baptism for the 11 of March. We taught a man whose name is Caio we found and we went to church, yesterday I was on a division with Elder Gilherme, the Zone leader, and we helped him mark the date 18 of March to be baptized. With our hard work the lord is giving us the blessings and we are seeing them in abundance. A few weeks ago I was not sure how we will succeed to baptize people this month but I knew it will work out and after the test of our faith we can see. The mission field is a wonderful thing, and to feel the spirit of this work is wonderful. We have been working to find the elect here in Perdoes and to find families to teach and help them receive the blessings of baptism and other ordinances of the gospel. We have been working as much as we can and we have found people that are receptive, the only thing to do now is help them recognize an answer that the Book of Mormon is true and the necessity to follow this answer. We are working with a young Woman, Katia who is the granddaughter of a sister in the ward, we have been helping her receive a desire to really pray about the Book of Mormon and see the importance of baptism and we will go with another member to help her feel the desire to really know. We found a family who the mom gathered all of the kids and husband to hear our lesson, I have never seen this on my mission, they accepted baptism and everything, but when we were marking the date for the to be baptism they were with doubt because they were baptized in the Catholic church and so on, we taught that a baptism is valid only with age of accountability, immersion, and with authority of God, we gave them the Book of Mormon and to pray to see if they need to be baptized again by whom that has authority of God and they accepted to read pray and visit the church. We continue to do our part to preach the gospel and with a little faith they will receive this answer from the Spirit and will be baptized. That is wonderful that Acea will go to Eastern and didn't even take a test, did the rules change? It would be good if you can send me some of Acea's music and some piano music of hymns of the church and other songs. And I would love to see some pictures from the Priest Laurel dinner Dance, and who will he go with and how did he ask? I heard about Karyl it is wonderful to hear that she is okay and that she will get a new car. I hope you Dad will get better, it is helps you here in Sao Paulo the weather has been about 90-95 degrees for many weeks and will start to get a little bit colder in a month or so. This week has been great, I feel that I am learning many things every day and it is great because this helps, in not only missionary work but also after my mission too. We are helping a great daughter of a member here in perdoes prepare to be baptized in the coming weeks, I feel that the lord is helping with our investigators and with our work, but I know that we need to work harder. Today I had the privilege to climb to the Top of pedra grande, about a 2 hour trip to the top in a pretty steep incline. It brought back the wonderful memories of the 50 miler and camping trip with the other young men in our ward, it gives my better feeling know that they are or preparing to serve missions and enter into this wonderful work. We both stayed in Perdoes for at least one more transfer, I will finish the training of Elder Inácio and I think I will leave but anything could happen. This last weekend We had the baptism of Antonio who is the dad of Uriel who was baptized the 15 of January, it was truly a miracle because his wife wasn't very interested never went to the church with him and he seemed he was without destion, but we said how are you feeling about your baptism this week, because it was marked a few weeks ago, there was silence, and he said, what time will it be. I was utterly trilled and we hurried to plan a interview and planed the baptism. The baptism was wonderful and we Had seen the gospel changed his life. This week we had decided to work in a neighborhood we haven't worked in, we didn't have any investigators in that area. When I arrived here 3 months ago there was nothing resent the Area book, we only had old investigators 8 months ago, and the people we had baptized had been references from the members and in other areas in the city. We both agreed to work there, it has been a little rough be we know that there are people waiting to hear the Gospel we just need to go find them. We are thinking of more ways to use the members and we are creating a atmosphere of success to help everyone in the Branch help. There is much work to do and with the lords help we will do it. This last week has really changed many things, one is that I have more energy and hope and faith to find the people that are prepared and waiting to be baptized. Last week was tough, but I look back now and see that Heavenly father was helping me learn many things with these hardships. We started out rough and end with not much success. Every appointment that we had fell through, 2 baptisms that were mark for this Sunday fell through, we only found 6 people, we had some days were we taught 2 people. I was thinking a lot what am I doing wrong, what do we need to do to find people ready to hear the gospel, how can we plan differently to be more effective, which neighborhood to work in, what do we need to do differently to receive revelation for our area, do I have faith to find these people? Then on Saturday we have the great privileged to learn from two apostles, President Jay Jenson, and other 70's. They spoke about the simple but powerful truth of the Restoration. They spoke about how we need to use the first vision to invite the spirit to change the hearts of people. For every person that has served a mission or has taught with the missionaries, when we retail the first vision of Joseph Smith you can fell the spirit stronger than the other parts of the lesson. Elder Ballard bore his testimony that is we trust in the spirit and share this experience with all the sincerity of our hearts, the spirit will enter and change the hearts of people. I felt hope and my faith grew knowing that we can find with the spirit and teach with the power of the spirit. We started this strong were we have found many great people, preparing to be baptized in a few weeks. 2 or 3 new investigators are good but our goal and our potential is to find 20 by the end of the week and help them prepare to enter the waters of baptism. we are helping the Dad of a young man we baptized a few weeks ago be baptized too and we are helping his mom enter the waters of baptism, what a wonderful work this is and how the lord helps us weak 19 year old boys do miracles and help our brothers and sisters return to the presence of our Father. Thank you for the support and the love, I am very very excited that been has received his call to serve in West Virginia it will change his life, and really it doesn't matter where you serve but how you dedicate your mission to the Lord. These week have been great with learning, teaching and preparing people to be baptized. We Had many miracles at church this last week, we were scrambling to pass by the house of our investigators and help them come to church, many that we had invited did not turn up, but 3 or 4 of our investigators arrived and were spiritually feed and started there progression to be baptized in the coming weeks, it also helped us know who to focus on and what we need to teach to help them progress. Uriel the young man that we had baptized last week was confirmed and we have seen in a few week the lives of this family change forever because of the wonderful message of the restored gospel. Dad thank you very much for the great ideas that we can talk about to help the work in Perdoes grow and how we can help retain and help our new converts endure to the end. That is so exciting that Sister strange is very close to enter the temple, can you give me her address I would like to write to encourage her and her family. This Saturday we will be listening to two apostles Elder Ballard and Elder Anderson, this will really be a day our mission will change for the better, we are preparing a lot for Saturday, with a fast, and preparing spiritually so that the spirit can't be hindered in teaching us what we need to learn. Elder Anderson knows Portuguese and will be speaking it to us, but Elder Ballard I don't think speaks Portuguese, we heard in the multi-zone conference of an experience President Tanner told to us. He had a friend attend the dedication of the MTC in Sao Paulo in 1995 where Elder Nelson dedicated the MTC. While he was giving a brief talk he stopped and said that the faith of the people there was sufficient that they did not need a translator any more. The Friend of President Tanner said He can't remember what language he spoke, but he remembered that everyone understood every word that he spoke. That spirit and faith is what President Tanner wants us to have so that we can really hear the Will of God this Saturday. Thank you very much for the some of the teachings of Elder Holland, it would be very neat to hear from him, I learn today that He Will not become Elder Ballard and Elder Anderson are coming but I am really excited to learn many things from them. I am learning, many things, every day I am learning how to work better with more effectiveness more power and work more with the spirit. We are having a little trouble finding the people that are really prepared to hear the gospel but with our faith and work we will be lead to those that want to follow Jesus Christ through baptism and enduring to the end. Elder Inacio is helping a lot, he is new but his energy and excitement is very helpful and he has very many good Ideas to help our work progress. We are helping the parents of a young man we baptized, be baptized too, they are progress, accept all of the commandments and commitments, the only thing that is left to be done is to continues to go to church to reach the day of Baptism. The Lord is helping us a lot and you can feel that he is helping the missionary work grow, have success and to perform miracles. Dad I have a question, you are the word mission leader, what are some things that are working to move forward the missionary work there, and some ideas that are working to create more references, anything that you are seen that might be useful. We have a Zone conference tomorrow and I will let you all know how it went what I learned, also I have sent some of the remaining pictures to that place in Gmail; some 60 photos. I forgot to tell you that I got the package last week, thank you a lot for the ties, peanut butter, jelly, raisins, honey and plastic sacks. I am glad that Christmas was good there at home, it is very different on the mission but it is always a good time of the year in any place. I have good news, the 28 of January we are having a conference with Elder Anderson and maybe Elder Holland, I am very excited to hear a apostle live and not through a TV I am excited. We are doing good here In Perdoes the work is progressing. We are helping one family enter the waters of baptism who are really golden, they accept everything we teach, we are planning to baptize the son this week to help his parents grow even more their desire to be baptized. we are finding more people who are just waiting to hear of the gospel, I received a letter from the Stake yesterday and in there there was a story about a conversion of a family, the father in this family started to have doubts in his Church and started really seeking for the truth, the missionaries passed by but his wife told them that they already had a Church, but years later they found a book written by Gordon B. Hinckley and were he speaks about the Book of Mormon, they find the Book of Mormon in a library and eventually they all get baptized. It really hit me again what we are here to do, bring the lost truth to people who are desperately searching or don't yet know that they are missing a part of something in their lives. This really is the truth Church of Christ and we are working together to grow this wonderful work, and that Heaven Father will guide us to his children that are ready to accept the true. The mission Field is really great and really is white, hot and rainy. we have had a wonderful week in which we both learned a lot. Elder Inácio is doing great he has a good spirit to learn and progress. His is from Rio Grande do Norte and is very hot there and his is suffering a bit here because is it very cold for him here and the rain wasn't helping. I have never seen rain like this before, it rains hard for most of the day for days at a time, but a good thing happens it cleans all of you cloths and shoes. We are helping and teaching a young man named Ureil be baptized this Sunday he is really good and really wants to be baptized and we are helping his parents be baptized too to help them really feel the powerful change the gospel brings and to return to live with heavenly father as a family. I am learning a lot with Elder Inácio with different ways to teach, setting a very good example for him and to work together to build up the kingdom here in Perdoes. One question that you asked me was about Christmas here in Brazil. Christmas isn't as big as it is in the US; Brazilians always like to have parties with friends and family. I think New Year's here is bigger than Christmas, we had a Churrasco (BBQ) with our District in Atibaia (a city close by that has the rest of our district in it) and all night long was a war in the street with fireworks, and shouting, but it was good. It would be good to send email on Tuesday because I am using Email 10:30 here in my time and leave in a hour or so and I love to hear from you guys a lot.